Come ring in 2019 with a climb on the classic McDowell route Hanging Gardens 5.6. 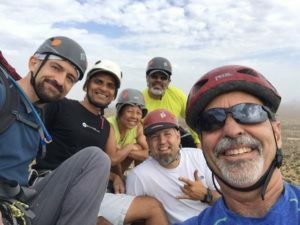 There are four spots available for this two pitch climb that will leave you with a smile bigger than your 2019 resolutions. IMPORTANT: if you have your meetup messages set to “off” and we have no way to communicate with you, you WILL NOT be approved for this outing. We will skip over you. So PLEASE make sure we have a way to communicate with you. Where: We’ll meet at the Tom’s thumb trailhead at 7:00am and be hiking promptly at 7:15. The approach: The approach to Gardner’s Wall takes roughly 60 minutes and is moderate to strenuous. All personal climbing and safety gear including harness, climbing shoes, helmet (required), rappell device, autoblock, and self rescue gear. Layers – Gardner’s Wall gets shady in late morning and can be quite chilly while you’re on the wall. Fortunately it’s sunny at the top. Dress accordingly to keep yourself nice and warm. Snacks/water: this will be an all day climb so bring some snacks. It’s reasonable to take a small bag on the climb with you if you like. We’ll be leaving our haul bags at the base of the climb. By Joinging this climb your are acknowledging that climbing is an inherently dangerous sport and that you are willing to accept the risks. All individuals RSVP’ing will be sent to the waitlist until AMC membership can be confirmed. You must be a current AMC member to attend this event.